Judging by my own experience and the experiences of people I know, the answer isn’t really that simple. Sure, it is a yes or no answer, but it isn’t simple, a point the one colleague made emphatically during the discussion. When you’re asked about purchasing insurance or an extended warranty? How do you usually respond? We all know that purchasing a warranty or insurance on a product protects against an unexpected future event. They are available “just in case” something bad happens later on down the line– whether that be tomorrow or a year from now. The problem is, how do we know? We don’t. We can’t predict whether that product is going to survive an unpredictable future. As my colleague mentioned at the end of the discussion, he was ready to say no, but what if a year down the line something happened? Basically, if you say no, you are taking the calculated risk that within the time you own the product nothing will happen. If you say yes, you have purchased a security blanket to cover you if something does happen. But then there is also a possibility that nothing will happen and you just wasted money on a big if. Here’s the thing about that big if. It’s not really about banking on something bad happening. None of us want that. It’s about being prepared should something bad happen. This becomes even more pertinent when talking about data loss. According to the article found here, “Computer loss, theft, natural disaster, and accidental deletion, are just some of the ways that you can lose the data you’ve spent so long creating and accumulating.” One keystroke can eliminate virtually everything on your hard drive. All your financial, personal, and patient data could be wiped out. Simply saying “but that’ll never happen to me” or “it hasn’t happened yet so I’m safe” is taking a huge risk. It does happen. I have seen it happen, and for those of you with no backup strategy, the loss can be devastating to your practice. When it comes to insuring your practice data, the answer should always be yes, because when it comes to information you cannot afford to lose, “the only way to prepare for the unexpected is to have a good backup strategy in place.” Do your research and discover what strategy is right for you and your practice. Even better is a backup solution that can do both– backup and disaster recovery. Check out our solution here that will make sure you’re not only backing up your invaluable computer data and images regularly but also will, should the unexpected happen, recover your lost data and get you back up and running quickly and easily. For more information on this cutting edge cloud backup system, just click the link below or give your Account Manager a call today. 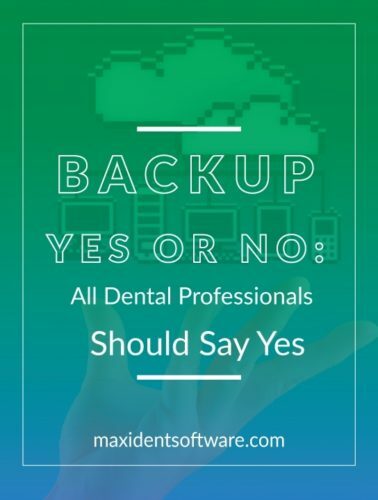 For the safety of your practice and the safety of your patient’s precious information, invest in a sound backup solution that will be there for you just in case. And for more information about backing up the data of not only your business but your home computer, check out the links below. How to Backup Your Computer: The Complete Guide to Computer Backup.